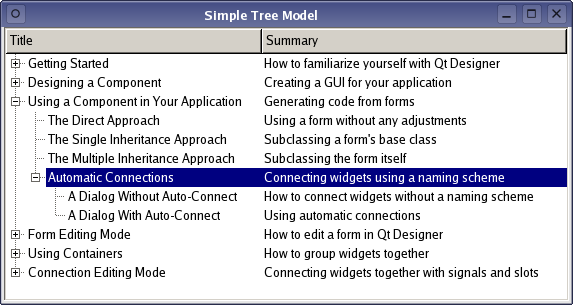 The Simple Tree Model example shows how to create a basic, read-only hierarchical model to use with Qt's standard view classes. For a description of simple non-hierarchical list and table models, see the Model/View Programming overview. Qt's model/view architecture provides a standard way for views to manipulate information in a data source, using an abstract model of the data to simplify and standardize the way it is accessed. Simple models represent data as a table of items, and allow views to access this data via an index-based system. More generally, models can be used to represent data in the form of a tree structure by allowing each item to act as a parent to a table of child items. Before attempting to implement a tree model, it is worth considering whether the data is supplied by an external source, or whether it is going to be maintained within the model itself. In this example, we will implement an internal structure to hold data rather than discuss how to package data from an external source. The data structure that we use to represent the structure of the data takes the form of a tree built from TreeItem objects. Each TreeItem represents an item in a tree view, and contains several columns of data. The data is stored internally in the model using TreeItem objects that are linked together in a pointer-based tree structure. Generally, each TreeItem has a parent item, and can have a number of child items. However, the root item in the tree structure has no parent item and it is never referenced outside the model. Each TreeItem contains information about its place in the tree structure; it can return its parent item and its row number. Having this information readily available makes implementing the model easier. Since each item in a tree view usually contains several columns of data (a title and a summary in this example), it is natural to store this information in each item. For simplicity, we will use a list of QVariant objects to store the data for each column in the item. The use of a pointer-based tree structure means that, when passing a model index to a view, we can record the address of the corresponding item in the index (see QAbstractItemModel::createIndex()) and retrieve it later with QModelIndex::internalPointer(). This makes writing the model easier and ensures that all model indexes that refer to the same item have the same internal data pointer. With the appropriate data structure in place, we can create a tree model with a minimal amount of extra code to supply model indexes and data to other components. The appendChildItem() is used to add data when the model is first constructed and is not used during normal use. The child() and childCount() functions allow the model to obtain information about any child items. Information about the number of columns associated with the item is provided by columnCount(), and the data in each column can be obtained with the data() function. The row() and parent() functions are used to obtain the item's row number and parent item. The parent item and column data are stored in the parentItem and itemData private member variables. The childItems variable contains a list of pointers to the item's own child items. The constructor is only used to record the item's parent and the data associated with each column. Each item is able to return any of its child items when given a suitable row number. 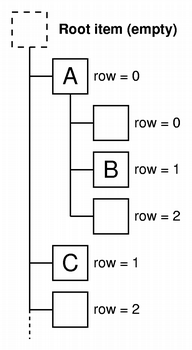 For example, in the above diagram, the item marked with the letter "A" corresponds to the child of the root item with row = 0, the "B" item is a child of the "A" item with row = 1, and the "C" item is a child of the root item with row = 1. The TreeModel uses this function to determine the number of rows that exist for a given parent item. Note that, although the root item (with no parent item) is automatically assigned a row number of 0, this information is never used by the model. The number of columns of data in the item is trivially returned by the columnCount() function. Note that, since the root item in the model will not have a parent, this function will return zero in that case. We need to ensure that the model handles this case correctly when we implement the TreeModel::parent() function. This class is similar to most other subclasses of QAbstractItemModel that provide read-only models. Only the form of the constructor and the setupModelData() function are specific to this model. In addition, we provide a destructor to clean up when the model is destroyed. It is up to the constructor to create a root item for the model. This item only contains vertical header data for convenience. We also use it to reference the internal data structure that contains the model data, and it is used to represent an imaginary parent of top-level items in the model. The model's internal data structure is populated with items by the setupModelData() function. We will examine this function separately at the end of this document. Since we cannot add data to the model after it is constructed and set up, this simplifies the way that the internal tree of items is managed. Models must implement an index() function to provide indexes for views and delegates to use when accessing data. Indexes are created for other components when they are referenced by their row and column numbers, and their parent model index. If an invalid model index is specified as the parent, it is up to the model to return an index that corresponds to a top-level item in the model. When supplied with a model index, we first check whether it is valid. If it is not, we assume that a top-level item is being referred to; otherwise, we obtain the data pointer from the model index with its internalPointer() function and use it to reference a TreeItem object. Note that all the model indexes that we construct will contain a pointer to an existing TreeItem, so we can guarantee that any valid model indexes that we receive will contain a valid data pointer. Since the row and column arguments to this function refer to a child item of the corresponding parent item, we obtain the item using the TreeItem::child() function. The createIndex() function is used to create a model index to be returned. We specify the row and column numbers, and a pointer to the item itself. The model index can be used later to obtain the item's data. We only need to ensure that we never return a model index corresponding to the root item. To be consistent with the way that the index() function is implemented, we return an invalid model index for the parent of any top-level items in the model. When creating a model index to return, we must specify the row and column numbers of the parent item within its own parent. We can easily discover the row number with the TreeItem::row() function, but we follow a convention of specifying 0 as the column number of the parent. The model index is created with createIndex() in the same way as in the index() function. Note that we only support the DisplayRole in this implementation, and we also return invalid QVariant objects for invalid model indexes. This information could have been supplied in a different way: either specified in the constructor, or hard coded into the headerData() function. We use the setupModelData() function to set up the initial data in the model. This function parses a text file, extracting strings of text to use in the model, and creates item objects that record both the data and the overall model structure. Naturally, this function works in a way that is very specific to this model. We provide the following description of its behavior, and refer the reader to the example code itself for more information. For each pair of strings on each line, create an item (or node) in a tree structure, and place each string in a column of data in the item. When the first string on a line is indented with respect to the first string on the previous line, make the item a child of the previous item created. To ensure that the model works correctly, it is only necessary to create instances of TreeItem with the correct data and parent item.